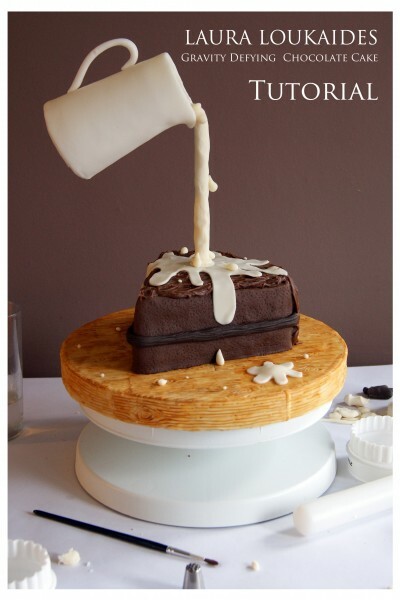 I loved the challenge of creating my first Gravity Defying Cake. If you have the right support system you can create endless designs to make anyone speechless. The cake I am showing you is on a much smaller scale, so you may need more fondant, cake etc than I am displaying. 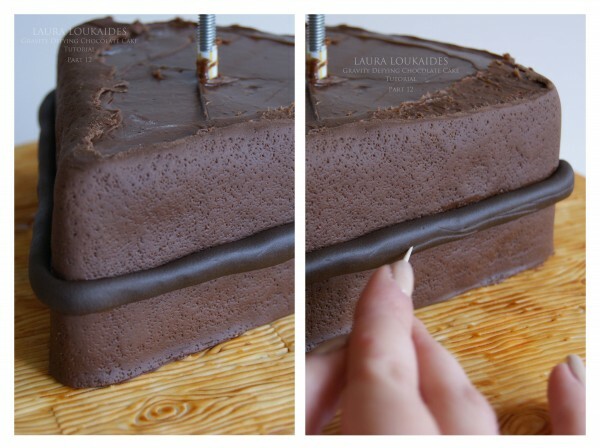 This is a quick and easy cake to make for your first Gravity Defying Project as it is quite small, but, using the correct supports you can make this as large as you need it to be. For best results, I advise that you complete the cake board and cream jug the day before assembling the cake; this leaves more than enough drying time. In the photo, you can see the basic support system for this cake, as I said before, this is for a small cake so larger cakes will need a stronger support. I used metal studding bent at a 90O angle. Next, you’ll need to cover the board. 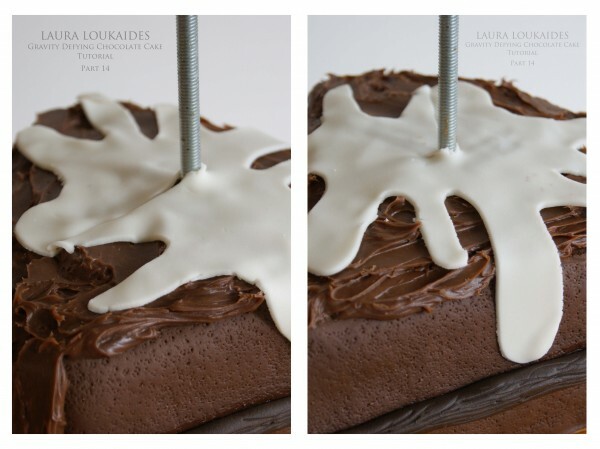 I used a wood grain effect as it makes the cake seem that little bit more realistic. 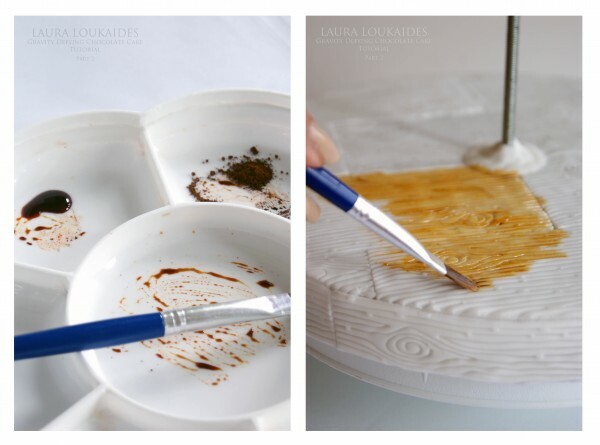 To make the wood grain, you will need to roll out a thin piece of white fondant, then press the impression mat down firmly and pull back to reveal the effect. 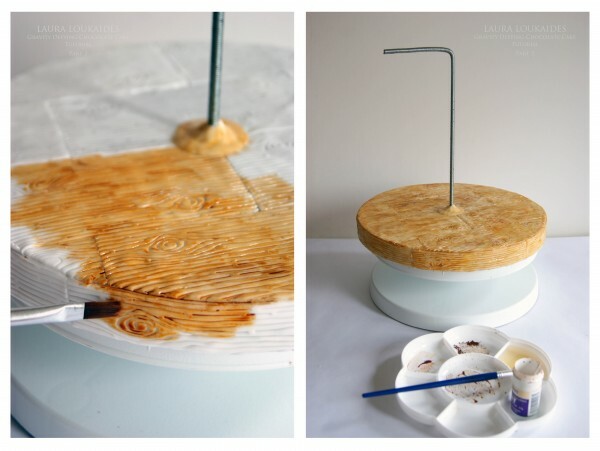 Cut out the individual planks and stick to the cake drums using some water. Cover the top first and then follow with the edges of the board. Once the entire cake board is covered, set aside to dry at room temperate. After the fondant has had a little time to crust, you’ll need to begin painting the wood grain. To do this, you’ll need a paint palette, paintbrush, Brown petal dust, (I used Sugar Flair) an Ivory Gel Colour and water (or Cake Decorators Alcohol). Take some of Ivory gel and put into the centre of the paint palette, then take a small portion of the brown petal dust, then adding the water to make it easier to work with. Paint the entire board this way. For an added effect you can use more brown to create an uneven tone, be careful not to go too dark or the Chocolate Slice will not show. Once the board is completed set aside and begin work on the Cream Jug. The Cream Jug is made from a small plastic cup; you can most likely find one like this at the supermarket. I wouldn’t advise using polystyrene or thin plastic cup as it just wouldn’t be strong enough for this project. The plastic cup like I am using is a strong enough to keep the fondant smooth and will be stable when added to the base. You’ll need to drill a hole in the bottom edge that is as wide as the support you are using to ensure the cup doesn’t move or slide off. Next, you’ll need to wet the plastic cup so the fondant will stick. Roll out a piece of white fondant and trim to a long rectangle that is about ¾ of an inch higher than the top of the cup. Leave the bottom open, this will be covered later. ** NOTE – The seam will need to be directly opposite the hole you made for the support, this is where the handle will go. 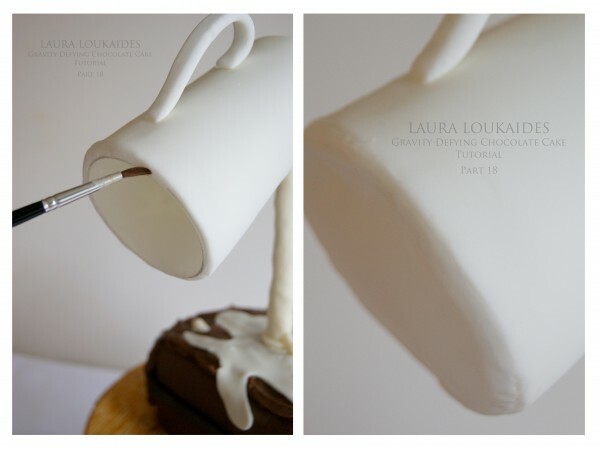 Next, using your little finger, gently push down the fondant in-front of the hole to create the spout of the jug. 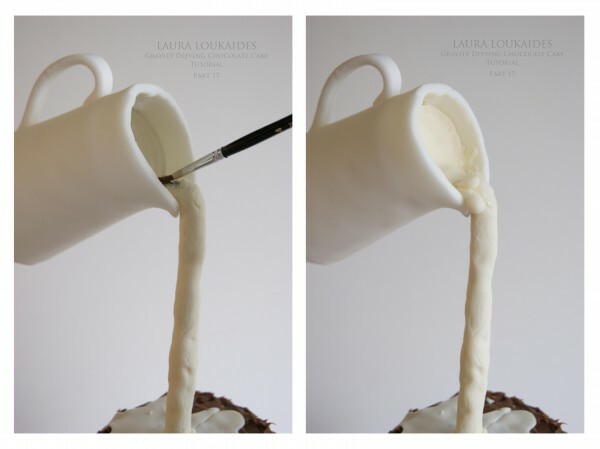 You’ll next need to create the handle for the jug using 100% gum paste. (I wouldn’t advise using 50/50 for the handle, I tried this and it just wasn’t strong enough) Put the fondant covered plastic cup on the support to attach the handle (to make it easier). 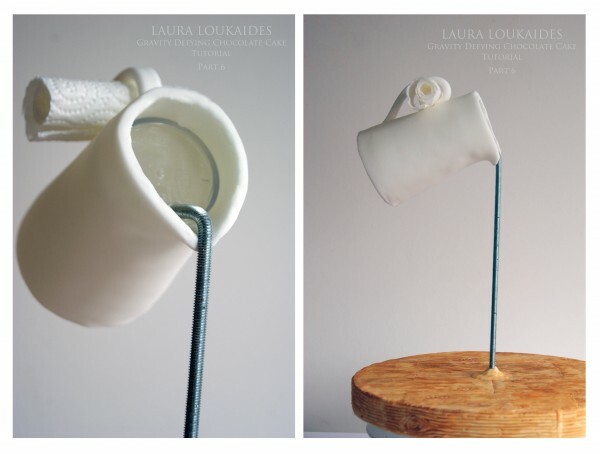 Using some water or edible glue, stick the handle to the cup, making sure it’s directly opposite the spout of the jug. Use a piece of rolled up Paper Towel/Kitchen Roll to support the gum paste to create the curve of the handle. Set aside the whole structure somewhere safe and stable at room temperature and leave everything to dry overnight. Once the handle of the cream jug has dried, remove the jug from the structure and set aside. Now, you’ll need to bake your cake. 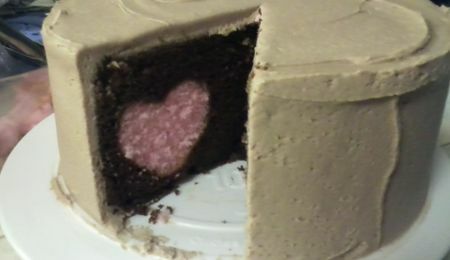 I used an 8” round 3” deep chocolate cake, but you can use any flavor you want. 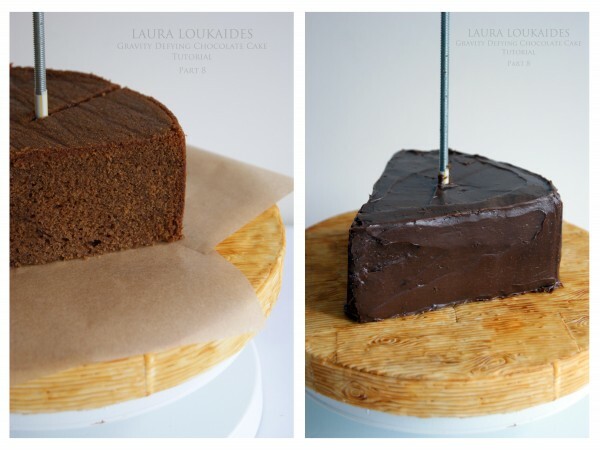 Once the cake has completely cooled, cut your “chunk” of cake and cut halfway through the back of the cake. 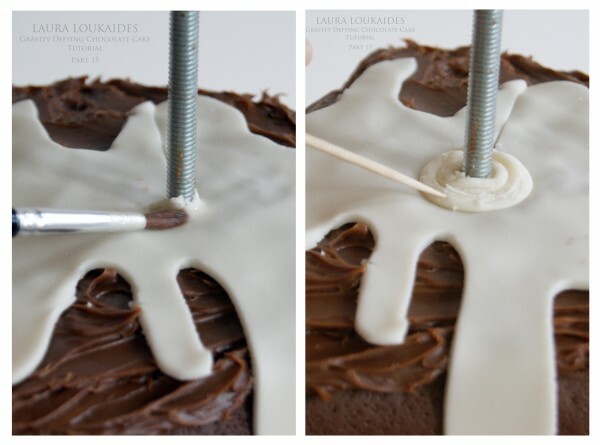 Cover the metal studding with the needed amount of drinking straws and place the cake around the support. Next, make your chocolate ganache. Prepare your cake for the Ganache. Cut wide strips of baking parchment/ Grease-proof paper and slide them just under the sides and back of the cake to protect the board. Cover the entire slice in the chocolate ganache and set aside for a couple of hours. After the ganache has had time to set, carefully pull the baking parchment away from the cake, removing the piece you added last, first. Brush the ganache with some water. Roll out a long rectangle strip of chocolate fondant just enough to cover the two sides; you do not need to cover the back. Trim the excess away and roll into a ball. Add some black gel colour to the excess Chocolate fondant to create a dark brown colour. 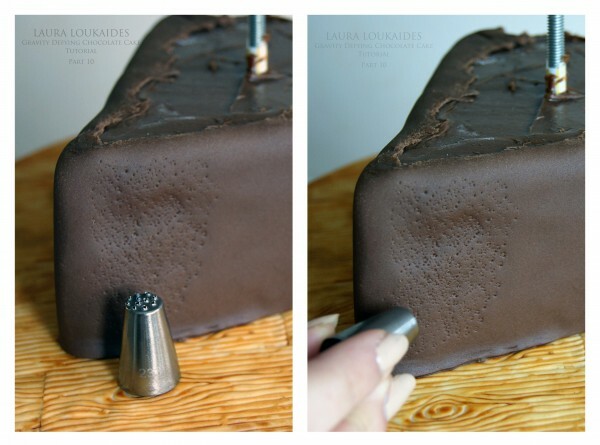 Using a cocktail stick, mark halfway up the cake; this is where the chocolate “filling” will go. Brush the mark with a little water so it will stick. Next, roll out an uneven sausage and apply it to the sides of the cake. 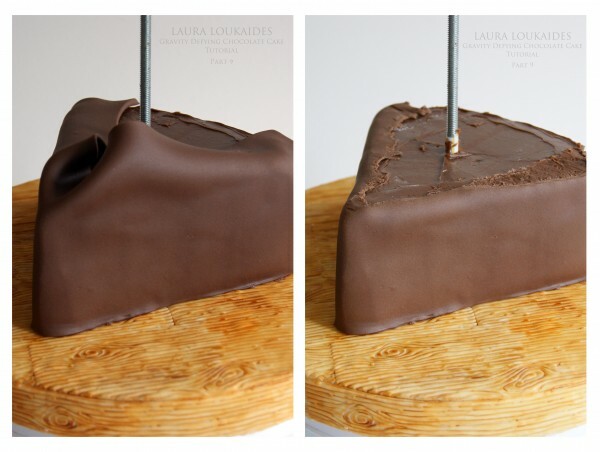 Using a cocktail stick make small waves to give the effect of ganache. 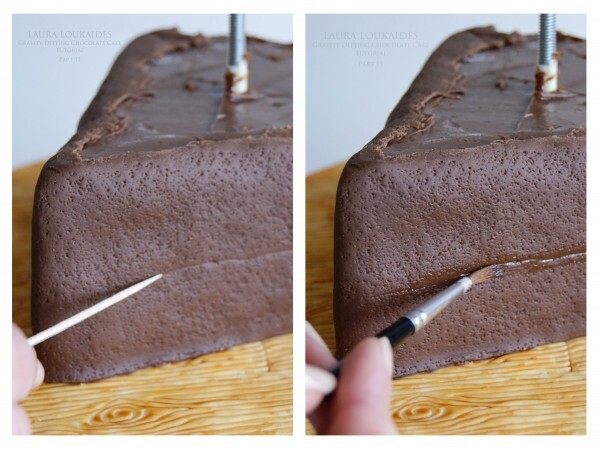 Take your chocolate ganache and spread it all over the top and back of the cake using a small palette knife, you can make this as thick as you like. Roll out a thin piece of ivory/cream fondant and cut out a splash shape. Decide which part you want to be the front and cut a slit halfway towards the back. Place the splash around the support. Roll out two small sausages to create the ripple effect, apply them using a bit of water. 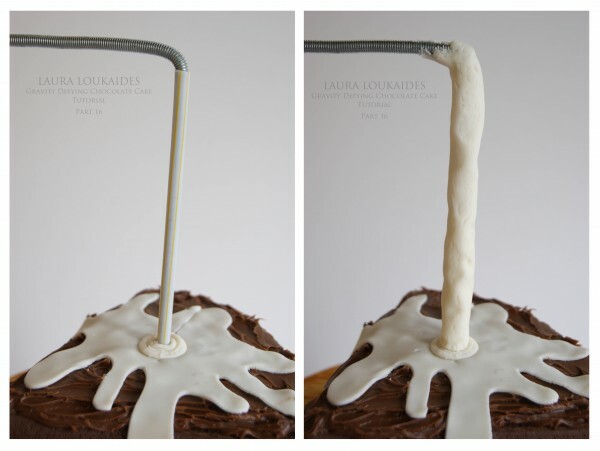 Add another drinking straw to the studding and add water so the fondant will stick. Roll out a thin rectangle of ivory/cream fondant and wrap around the straw, trimming away the excess. Pinch and mark the fondant to add texture. Next, add the cream jug. Using a small amount of water apply a circle of ivory/cream fondant to the top of the jug; cover any seams with fondant droplets and splashes. 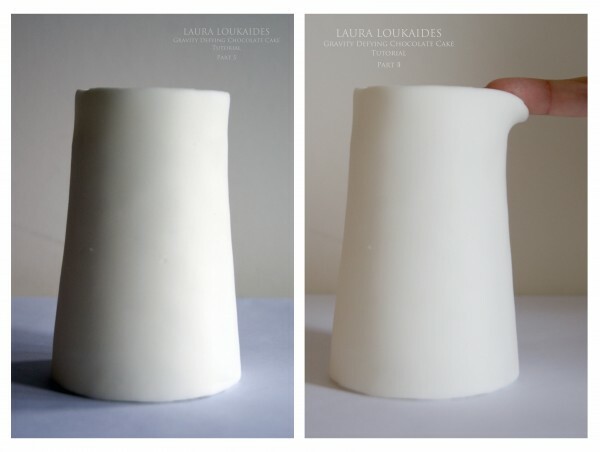 Finally, cut a circle of white fondant and apply to the jug, smoothing the edges to create a seamless effect. STEP 12 – Finishing touches. To finish the cake, make a small splash and tiny dots from left over ivory/cream fondant to create a messy, rustic look. I hope you all enjoy making this cake just as much as I did. 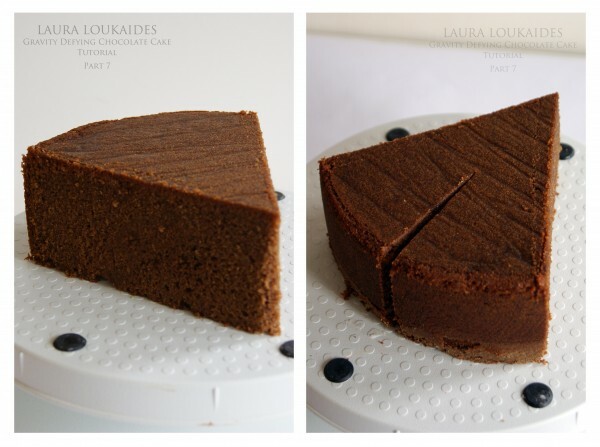 If you decide to make my "Gravity Defying Chocolate Cake" don't forget to come and post your photos on my Facebook page, I'd love to see them!! This is AMAZING!!!!! GREAT JOB!!! Love it. Thank you for great tutorial. It is a big help. This is amazing, thank you! Will definitely be trying it out! Not quite sure I understand how the jug is securely attached to the support though? This is amazing!!! I am just wondering how you get the metal rod to stay upright? Is it simply stuck into the 2 cake drums or is there additional support underneath? Trying to work it out :) Thank you for this tutorial!! Great tutorial; however, I do have the same question: how did you get the standing pipe piece into the board? Is it screwed into place? Gotta try this! Thanks for sharing. Thank you so much for sharing this! Your cake looks AMAZING!! 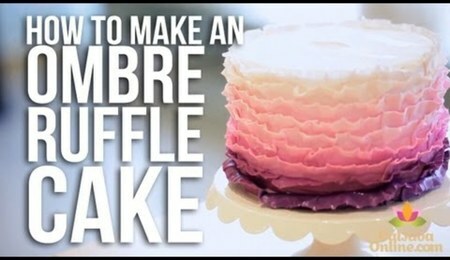 Thank you so much for your tutorial, I've always wanted to do this type of cake,but didn't know how. You're wonderful..
Can you please tell us about the metal rod. You haven't talked about it being food grade metal or washing it or even how it is attached to the board! Looking at your tutorial it seems you have"glued" it in place with gumpaste. Awesome cake btw! Hi Everyone, I'm glad you like the tutorial! Sorry I wasn't too clear about a few things in my tutorial. 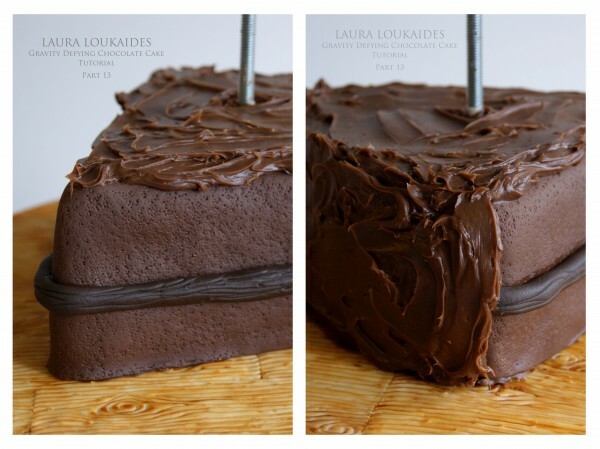 The Metal Rod is completely covered in Drinking Straws so it will never touch the cake. 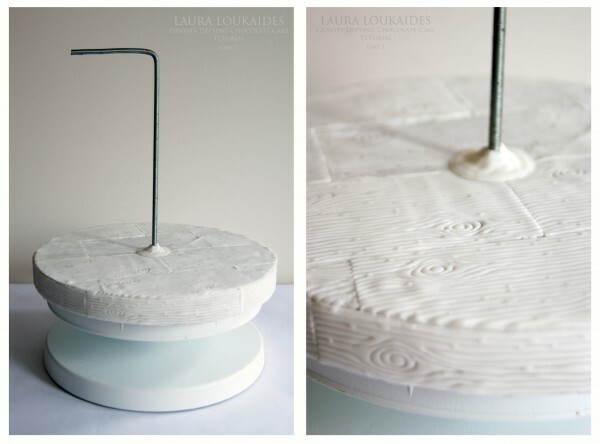 The Metal Rod is secured underneath the second cake drum, you will need to use a washer and nut to secure it into place, you will also need to make a small "well" underneath the second cake drum so it sits flat on the counter top. The Metal rod goes straight through the two cake drums and is secured underneath. 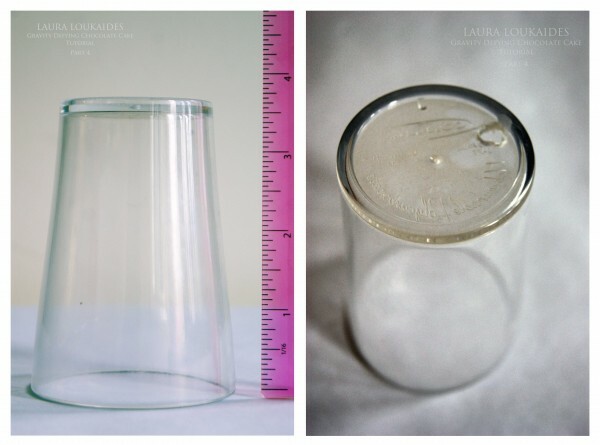 Because of the texture of the Metal Rod, The Cream Jug stays securely in place without movement, you just need to make sure that the hole you make in the plastic cup isn't too large or it will slide off. Thank you so much for taking the time to respond! That is awesome! What tool did I you use to bend the metal studding rod? Was it 1/4 of an inch? Thanks so much for the tutorial! !